Last Friday afternoon, exactly four days after Nanay was discharged from the Philippine Heart Center (PHC), we accompanied her to the clinic of her heart surgeon for her first follow-up checkup after her coronary artery bypass graft. This was to check for any infection and to remove her remaining surgery stitches. According to Dr. C., there seems to be no signs of surgical site infection. He also looked at Nanay’s left leg where most of the vessels used for her heart bypass came from. 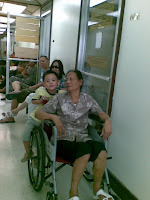 There was a hematoma on Nanay’s upper left leg. Dr. C.said that area should be massaged gently and should be treated with a hot compress. He’ll have to see on our next visit, which is next Saturday, if it has to be aspirated. 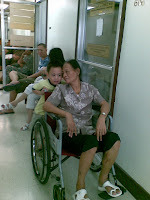 I was surprised that we were not charged a consultation fee after the good doctor was done examining our mom. I don’t remember any of my doctors at Makati Medical Center giving me free follow-up checkups after my craniotomy in 2004! Now, this tells me that PHC doctors have a heart! I’m starting to love them already! Oh, by the way, children below 7 years are allowed in the doctors’ clinics at PHC, so we made sure to bring Justin along. Do you know what kept him busy outside the clinic while waiting for Dr. C. to arrive? Nanay’s wheelchair! He was having a really good time maneuvering it and making it stop when he wanted to. So, do you think Justin will come again with us on Nanay’s next follow-up checkup? This entry was posted in CABG, Followup Check-up, Heart Bypass Surgery, Nanay, Philippine Heart Center. Bookmark the permalink. I'm glad that your mom's operation was a success. Wishing her a quick recovery. God bless. 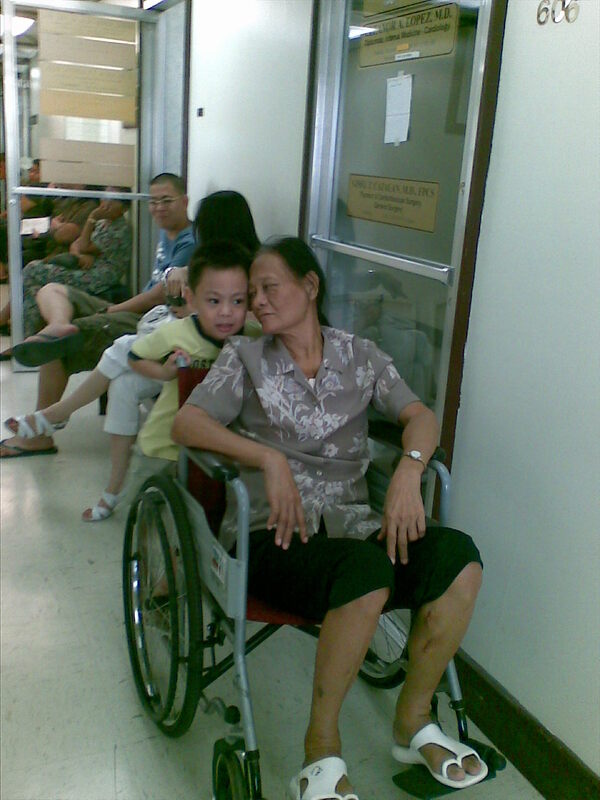 Hi Tetcha, here's wishing your Nanay a quick recovery and get well soon. You have a pleasant week and Ingat ka palagi, Lee.